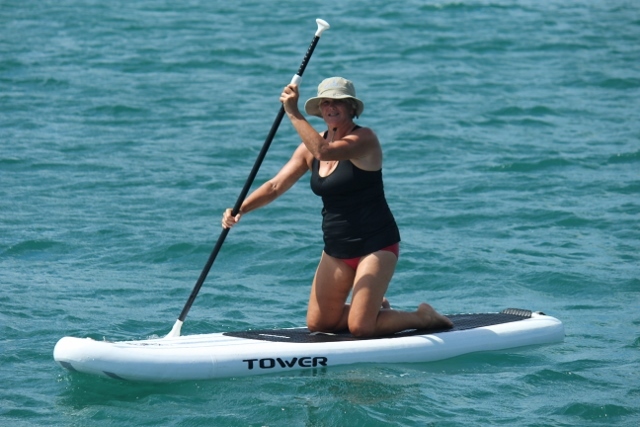 A follower of our blog asked me about ideas for space saving when travelling in a caravan and after recently reading Windtraveler’s post Ten Simple (and inexpensive) products we Love on our boat, I got to thinking about the products I use that are a must-have, non-negotiable item on Kool Kat. By the way, if you haven’t tapped into Brittany’s blog before and you want to put a smile on your face, do yourself a favour and check it out here. She, Scott and their three little poppets lead an amazing life. So, getting back to non-negotiables, I got to thinking and I got to talking to other cruisers in the sailing sisterhood, and this is what I came up with. No 1: Totally in agreement with Brittany, and many others, that the ‘Turkish’ towel is brilliant! 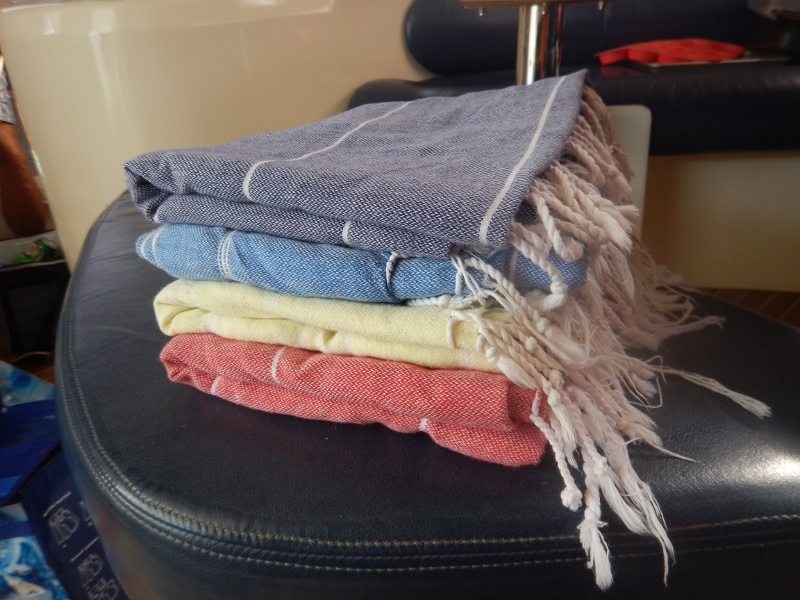 It takes up no room, is light, dries quickly and is super versatile, morphing from a towel into a sarong/pareo into a beach blanket! There are many versions available but my favourite is Hammamas which we bought in Australia. Other cruisers I know who swear by them bought their towels in the US or in St Maarten. What I like about the Hammamas is that mine has softened up beautifully over time and they have a huge range of colours. No 2: Second on my list is Silicone bakeware. Cruising provides many opportunities to ponder one’s navel, even on a 3-hr crossing, and one thing I have discovered is I love to cook. Hold your horses, I need to be more specific here! I love creating healthy, SIMPLE, food and I’m not into creaming butter and sugar or sifting flour six times! I like it pretty damn easy, particularly as I’m in a cosy (read small) environment. Okay, monohull girls, I know I’ve got it pretty good but everything is relative! Anyway, I don’t like having to clean up a big mess afterwards either and this is where my silicone products shine (well, not really as silicone is quite dull). 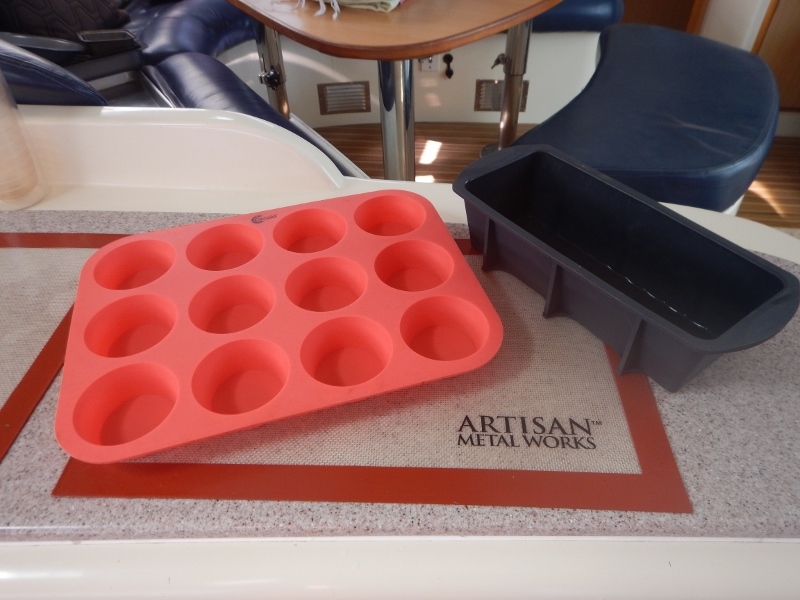 Silicone bakeware: muffin tray, loaf pan and baking sheet. Last year I bought, through Amazon, a silicone 12-muffin tray and two silicone baking sheets. Then on one of the French islands I spied a silicone loaf pan. All I can say is that I use these four items at least once a week. They are light and flexible which makes them easy to store and they are an absolute bonus when it comes to cleaning! 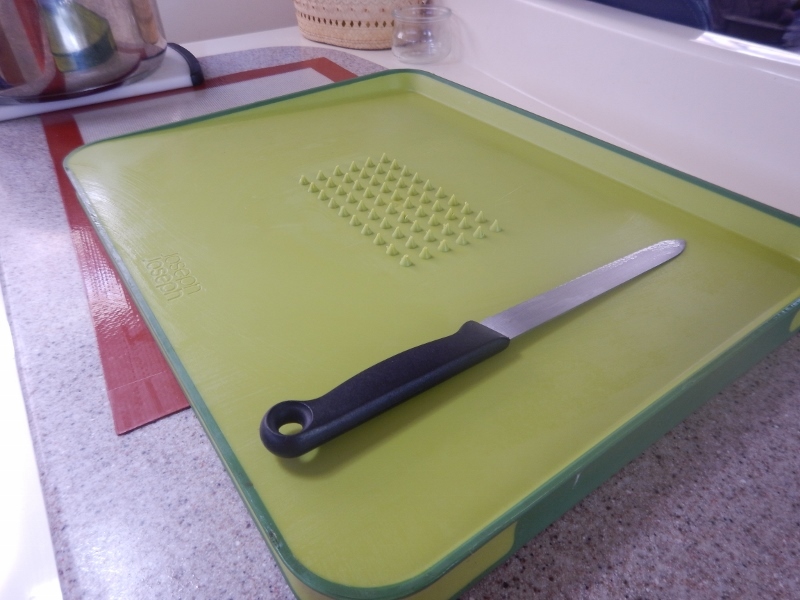 Check out my previous post about using the muffin tray and the baking sheets and pay particular attention to my advice about what to look for when buying silicone products as there are varying standards. Some people worry that they don’t brown the food but my experience is the opposite except on one occasion and you’ll see why when you read the post. No 3: Before we set out on this adventure I read an article about one item women cruisers seriously valued and the TEFAL Ingenio saucepans came up a few times. I set about trying to find them in Australia only to find out they weren’t available. Long story short, I was able to get a set and they have been one of our best purchases. Our set is made up of 3 pots; stainless steel inside and out, 3 glass lids with silicone edges, removable pot handle, removable lid handle and three plastic lids. The beauty of them is that they take up much less space than regular pans with attached handles, I can see through the glass lid as food is cooking and I can reseal with a plastic lid for storage of leftovers in the fridge or freezer. They are easy to clean and the large one is plenty big enough for pasta and soups. Check out my Galley Series post to see one being used to cook callaloo soup/fritters. I have prepared a short video showing how easy it is to affix and remove the handles. No. 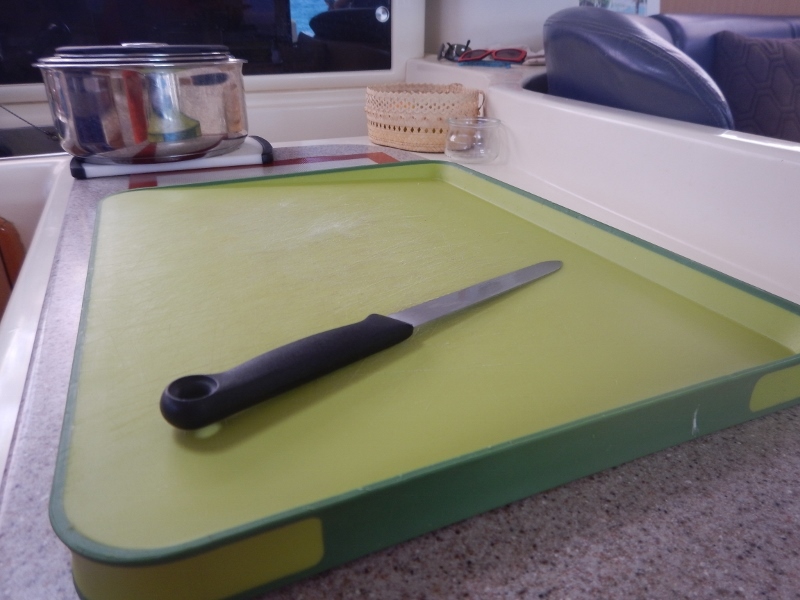 4: Brittany refers to a flexible chopping board and I’m thinking I might get one of those too but I do like my Joseph Joseph chopping boards. This isn’t actually a non-negotiable but I do really like them. I have a small white one and a larger green one. The bit I find really handy is the lip on one side which catches runaway liquids and, on a boat, they runaway alot! The boards are reversible, meaning the lip is on both sides and one side also has several prongs to secure whatever it is you are carving. They work really well. Slant on board catches juices in lip. Reverse side with prongs to prevent slipping. No. 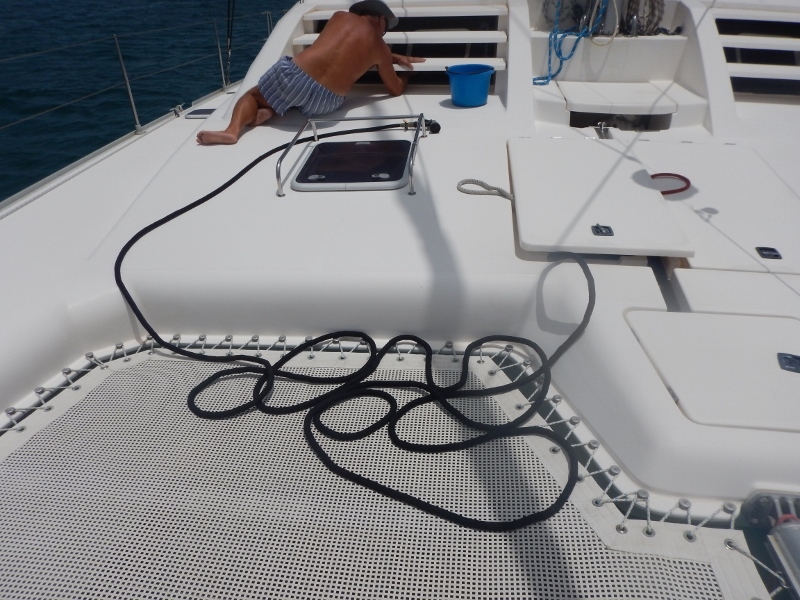 5: Moving away from the galley, another excellent purchase we made was the hose we use for washdown. I read an article on the Boat Galley blog about the XHose Pro and we decided to lash out and pay a little more when we needed to replace ours. It has been so worth it! It takes up very little space as it retracts when not in use and expands when filled with water. 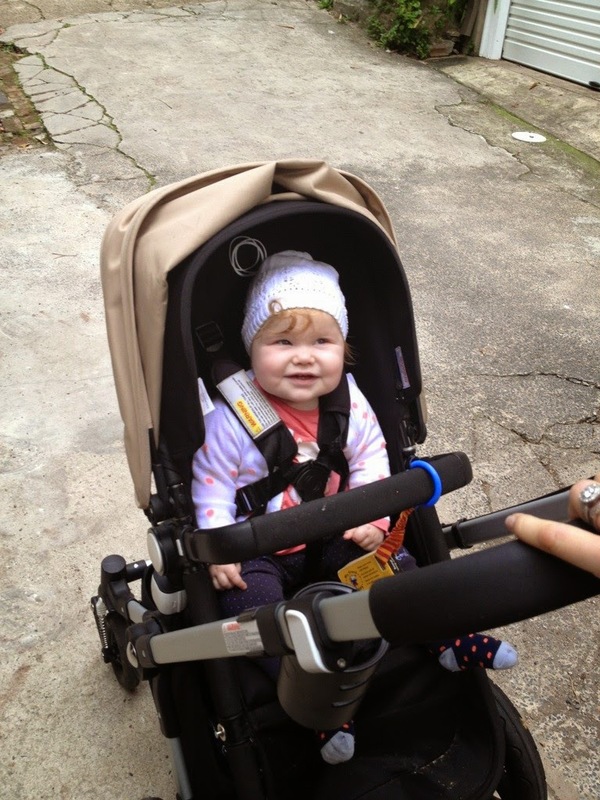 It is light, easy to manoeuvre, covers a large area, packs away in a small space and we love it! 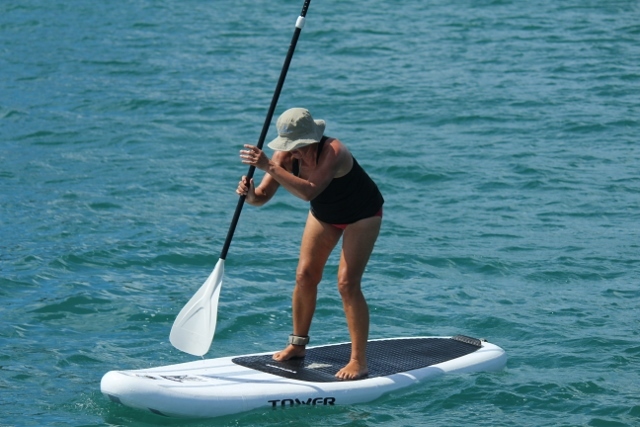 This is expanded with water and remains easy to take anywhere on the boat. This is deflated with no water in the hose and it just fits really easily. The above items are all purchases Mal and I made but we were fortunate enough to have alot of equipment left on our boat by the previous owners; thanks John and Linda. It’s a running joke with our friends that when someone asks us where we bought something, eg: dinghy ladder, we reply ‘it came with the boat’ much to their chagrin! No. 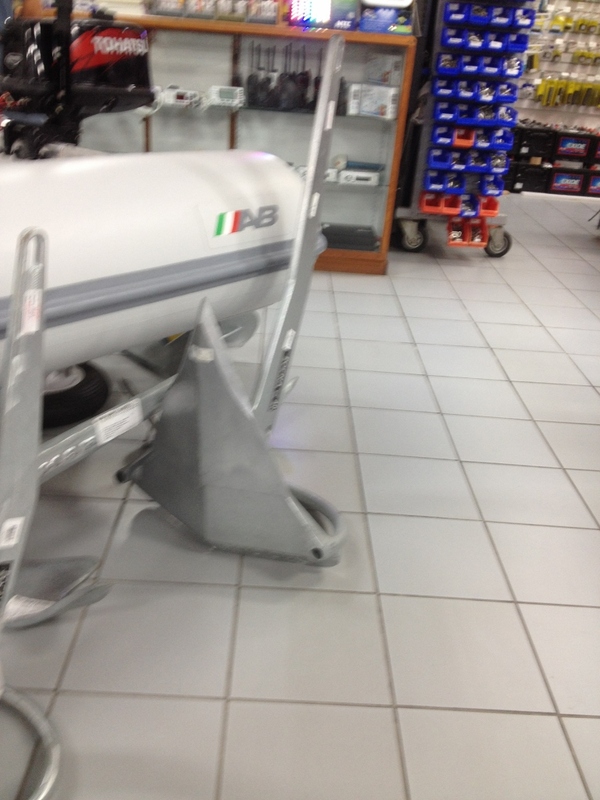 6: Yes, the dinghy ladder! 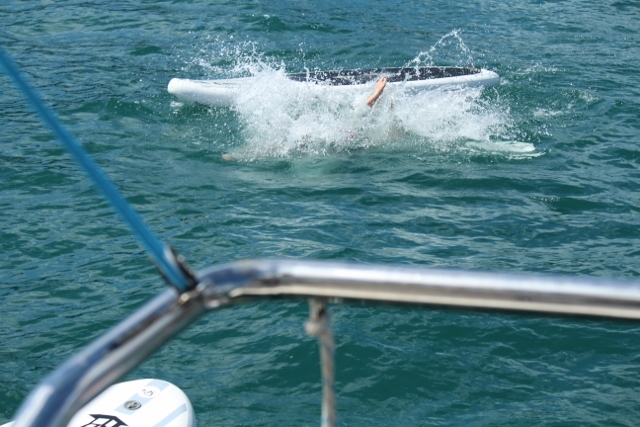 It is an invaluable aid when you are exhausted from snorkelling and you need to drag yourself back up out of the water and into the dinghy. Without a ladder it can be like watching a whale beach itself, only not as gracefully! 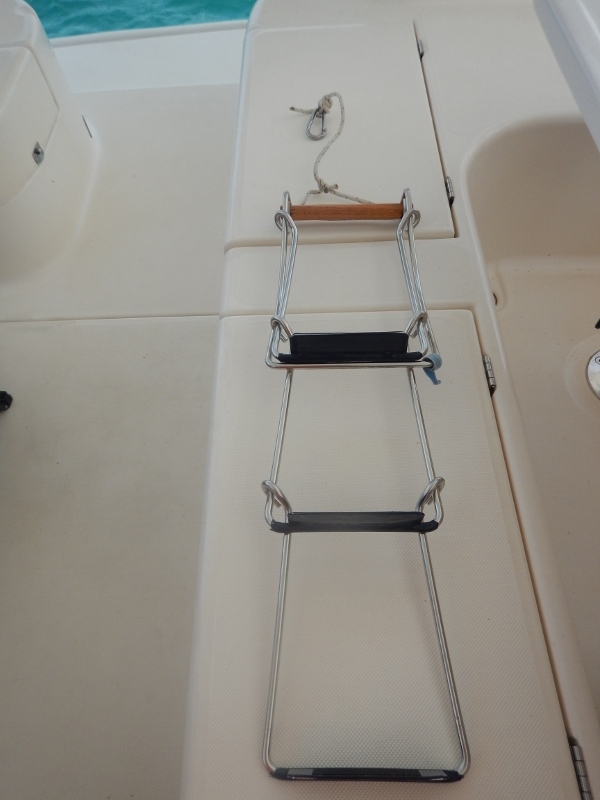 The ladder ‘that came with the boat’ is called “Up-n-out” by Scandia Marine Products; it is sturdy and collapses into a small bag for storage. No. 7: The Tervis tumblers ‘that came with the boat’ have been a godsend in the sometimes sticky but always hot Caribbean weather. We have both the tall and the short and they keep those deliciously refreshing G&Ts we are so fond of, beautifully cold! Gin and Tonics in our Tervis tumblers at the end of the day! So, there we have it, some serious non-negotiables and some must-haves when cruising. What are your non-negotiables? A first big year or a big year of firsts! 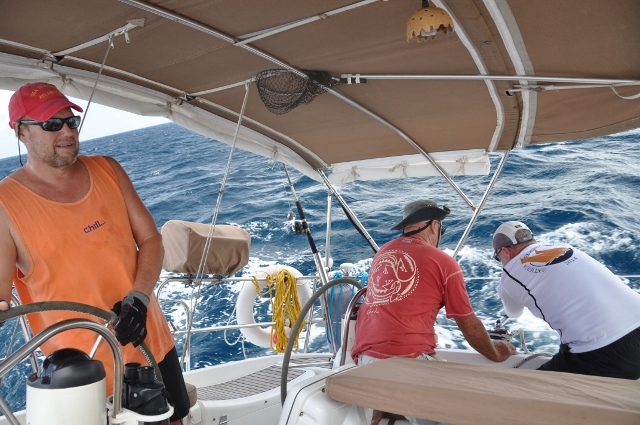 I was reading our friends Alex and Dave’s Sailing Banyan blog, which neatly summarised their second season* of sailing in The Caribbean and it got me thinking about our adventure living on Kool Kat since February this year. It struck me that, so far, it has far exceeded both our expectations and that it has been a big year of FIRSTS. I knew Mal had a pretty good idea of what it would be like but I was worried I might get bored whilst we were waiting for the hurricane season to pass. I mean, really, what is there to do when you can’t go sailing very far, you don’t know many people and it’s so damned hot? Well, you use the time productively doing boat maintenance, swimming, fixing the broken bits, swimming, making friends, more swimming, sailing to close islands and back, still more swimming, and doing lots of stuff for the FIRST time! 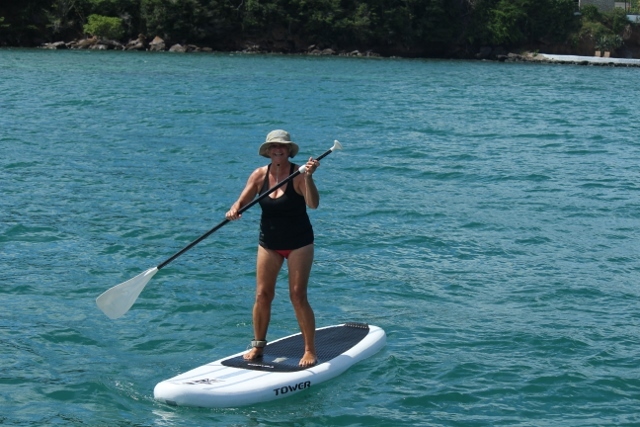 step 4, paddle and then smile at the camera. Their instructions worked, with some minor hiccups, and we now want two. 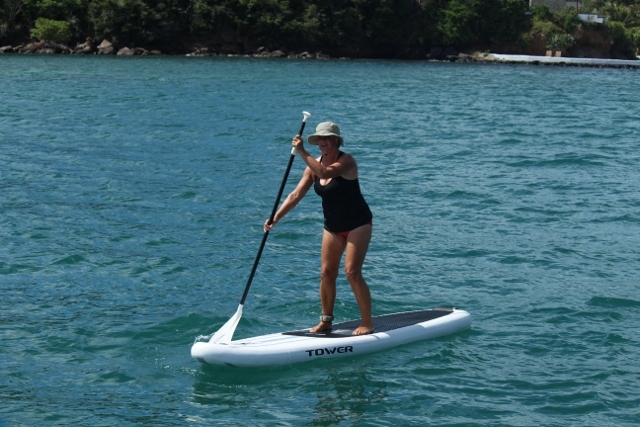 Thank goodness for the warm Caribbean water 😉 Thanks to Jody and Peter for the loan – I know we got the good end of the deal! The following are pictures of some other FIRSTS this year for Team Kool Kat. Not all were planned or expected! 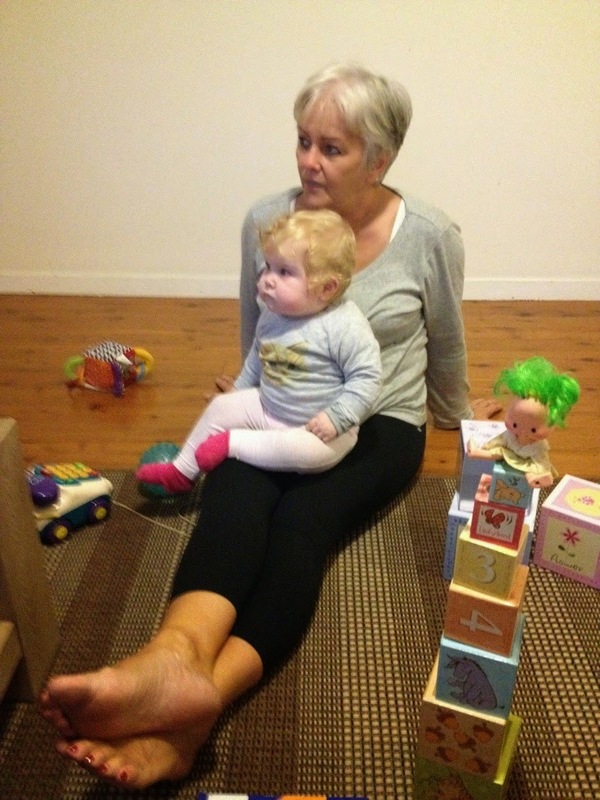 We’ve now joined the Rocna Club with this big mumma, 40kgs. Jo & Bob – we hope you come back soon! up-close experience with turtles: swimming with green and hawksbills and stroking a gigantic leatherback whilst she laid her eggs – absolutely gob-smacking for us. living on a boat AND living 24/7 in each other’s pockets: a challenge but we wouldn’t change it for the world. That’s all the FIRSTS we could think of although I know we’ll remember a few more after the post is published! What have been your memorable FIRSTS this year? We hope they were good and we’d love to hear about them so drop us a line. *The Caribbean sailing season is roughly from November to June. Note: Thanks to friends who have taken some of these photos and, in particular, thanks to Jo Almond for the sunset image. Internationally Renowned Award, well almost…. 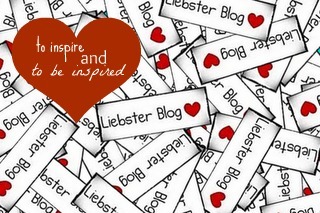 Thanks to Alex & Dave from Sailing Banyan for nominating our blog for the Liebster Award! I was totally immersed in Alex’s post responding to their nomination when I realised they had nominated us. What a pleasant surprise. It’s all a bit of fun and Mal & I are always up for that so let the fun begin! There is a large array of definitions when googling ‘Liebster Award’ so I read through a couple and selected one. 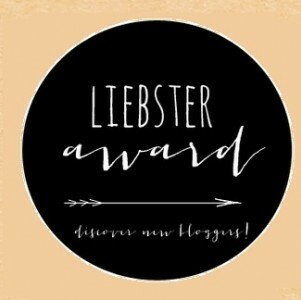 According to experienced blogger, Lorraine Ruguly at http://www.wordingwell.com, the Liebster Award is given to relatively new bloggers and it is their decision whether to accept it or not. If accepted, a set of Q&A are worked through, other bloggers nominated, a new set of Q&A are set and the fun continues*. Fun, that is, if you are a blogger. If you don’t enjoy the game, you don’t need to accept or continue. Mal & I chose to continue because we like blogging, we love reading about other people and their experiences and, as I said earlier, we’re always up for some fun. So, thanks again to Alex & Dave on s/v Banyan for the nomination and here are the answers to your questions. We have taken a leaf out of your book by answering some questions individually when we couldn’t agree on the same answer 🙂 What, I hear you say, Mal & I don’t agree? Now, there’s a surprise! (1) Where in the World are you? Alternatively, where would you like to travel to? 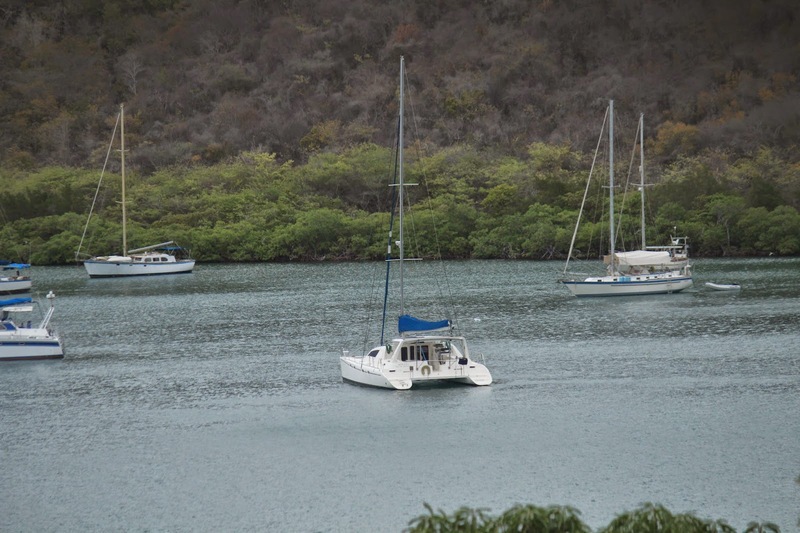 We are at ‘Camp Grenada’ in Prickly Bay on the island of Grenada waiting for hurricane season to end before sailing north, together with hundreds of fellow cruisers. (2) Describe the funniest thing you’ve witnessed in your travels to date? Funniest or strangest? We had one of those moments when we both looked at each other and said, did you just see what I saw? We witnessed a flying stingray only a few metres from the boat in Tobago Cays. It was about 18″ above the water and moving very quickly. When we googled flying stingray we realised it wasn’t that unusual and agreed that we’d take a flying leap too if something big was chasing us! Well, we’ve agreed on two answers so far. (4) This Sailing Lifestyle has obviously been a dream turned reality for all of us out here doing this. But if you could have another dream, another “thing” you would want to do… what would it be? If it involved sailing, we’d like to cruise either the Mediterranean or the northern coast of Australia. If not, it would be to live for a period of time in Europe somewhere, eg: France, Italy, Spain. This agreement stuff is getting way too spooky! (5) If there’s one thing you brought with you cruising, that is totally useless and you could take off your boat, what would it be? Alternatively, if there’s one thing you didn’t bring with you, and wish you had, what is it? Mal: I wish I’d brought more measuring tools, such as ‘dividers’. Sue: Makeup, it’s useless here. It’s so hot I never wear foundation of any description. Interestingly, my skin seems to like it! (6) In this world of So Many Blog’s, have you followed a Blogger and not yet met them? Who would you most like to meet? Sue: Yes, I’ve followed “A Cup of Jo”. She is a NY young Mum and I really enjoy her writing style. In relation to sailing blogs, I keep coming across Sheryl and Paul of “Distant Shores” http://www.distantshores.ca/boatblog.php when looking for information and hope we cross paths one day. Mal: I like to read blogs of cruisers we’ve already met, like Banyan and Amoray. (7) What time of day do you enjoy the most and why? Early evening. Normally the water is calm and we enjoy a G&T on our back “patio” whilst watching the sun go down. Although last Wednesday we went kayaking with two other couples at 4.30pm and it was just magic; calm and peaceful. (8) When we set sail, and told our friends and family of our plans, we received some pretty incredible (and also incredulous) responses. Have you? Describe the one that impressed/shocked you the most? Our family and close friends have been very supportive but what surprised us was how many people commented on how courageous we were. We didn’t feel particularly courageous so we are either incredibly naive or just see this as the next chapter in our lives. (9) With this travelling lifestyle we get exposed to wide variety of cuisines. Do you enjoy trying, eating, cooking with “local” foods, and if so, what is your favourite so far? Share your recipe ?? Yes, we love trying the local foods and will normally give anything a go. Lobster was Mal’s first response but, of course, we do get that in Oz as well, albeit it’s hellishly expensive. Sue: I’ve really enjoyed eating callaloo but haven’t yet experimented cooking with it. I’ve got a recipe for callaloo soup from Kiwi John which I will try very soon but I’ve also enjoyed callaloo and saltfish fritters. We both love soursop smoothies from the Spice Mall and, with the proliferation of mangoes at the moment, I’ve been making mango lassis every day! Recipe: mango, yoghurt, ice, milk and a smidge of honey; delish! (10) If asked to give a random piece of advice about this lifestyle to anyone, what would it be? Mal: Make sure you buy something comfortable and, if you don’t like rolling in your bed at night, buy a catamaran! Sue: Do it and do it now. Don’t wait. We’ve met so many fabulous people with amazing stories to tell and we’ve seen some incredible places. We’ve also met people who, for one reason or another, have been forced to “retire” from this lifestyle and it reinforces our desire to keep going. I hate to borrow from a multi-national brand and friends in Oz have heard me say it many times before, JUST DO IT! Phew, the hard bit’s over and we actually agreed on many of the answers! Go figure. Now for some nominations and questions. Many blogs we follow have already been nominated so our list is very select! 1. What is that special something about your boat that you love? 2. What is the hardest part for you living 24/7 on the boat? 3. What helped you decide to take up this cruising lifestyle? 4. If you could offer some pearls of wisdom to newbie cruisers, what would it/they be? 5. If money was no object and you could make a change to your boat, what would it be? 6. What is something new that has surprised you about your partner since you commenced this lifestyle? 7. Has your initial estimate of how long you’ll be cruising altered since you first started? 8. Did you name your boat and, if so, why did you choose the name? If you didn’t, would you like to and what would you choose? 9. What is your favourite cruising destination to date, and why? 10. If there was one wish a jeannie in a bottle could grant you now, what would it be? We also have friends who read our blog but don’t write one themselves. To you guys, I hope you discuss the questions and let Mal & I know some of your answers next time we catch up. *For a far more detailed set of rules, please check out http://www.wordingwell.com for a comprehensive and selective list. Summer is the wet season over here and most nights we have rain. During the past week we’ve had two days of continuous rain which means we either don’t leave the boat or we wait for some respite and make a quick dash to shore! It never fails to surprise me how quickly the dinghy-cover dries out once the rain has stopped. Temperature doesn’t vary much and is around 29C most days with humidity around 65%. Normally we have a breeze so it’s good but, if not, it’s swim time off the back of the boat. This time I brought back with me from Oz a good rain coat (thanks Annie) and found a use for it last Friday when walking over to Secret Harbour for our volleyball game. Mal got drenched but Susie stayed dry! We’ve been playing quite a bit more volleyball lately (3-4 times per week) and, as I’m getting a little better, I’m enjoying it more:) Most couples don’t like to play on the same team as their partner and Mal & I are no exception. Less arguments that way! Canadian friend Dalynn took the photos below including the iguana shot. It lives in a tree overlooking the volleyball court so we often catch sight of it munching on the new shoots. We did hear the other day that the locals have spotted it so we’re hoping it will survive. It looks like a young one as it’s not as large around the girth as some we’ve seen on other islands. Mal in blue & Gagi in pink. Mal & I on opposition teams. Don’t think I got this one! 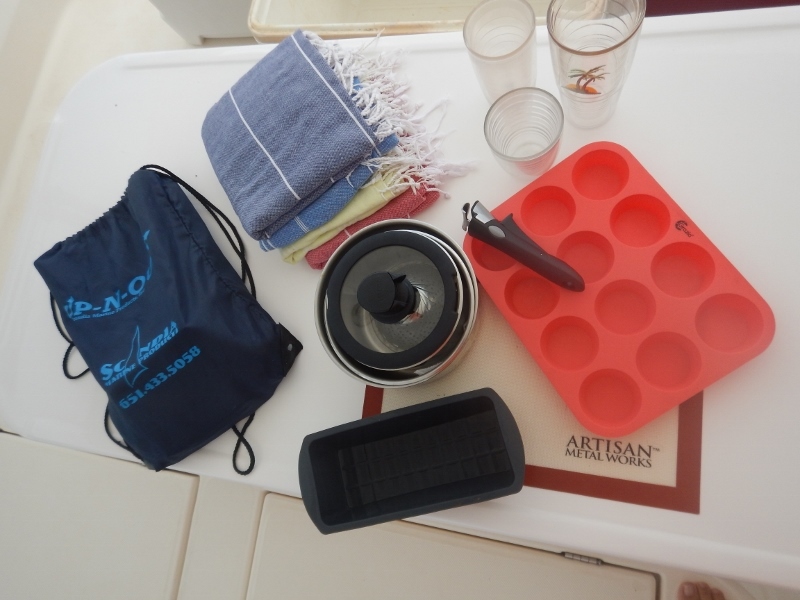 Entertaining on the boat can be a challenge but we’re getting better and we’ve mastered a few dishes. One is a Bill Granger chicken curry (thanks for recipe Rob Mc) which went down a treat with our guests, Gagi (pronounced Guggi) and Rudy, Anjelica and Dennis. Gagi is an accomplished “beader” and has given me some materials and advice to get me started as a hobbyist. On those wet days when we can’t get off the boat I need something other than reading, cooking and boat maintenance to do. Here are some pieces I have created. I’ve learnt how to do sliding knots which I like as a fastener. There are so many varieties of beading that mine is very different to what Gagi designs. Hers is very fine work and has a high level of complexity to the designs whereas I’m into simple, quick and easy, ready to wear! It’s been alot of fun and I’ve now discovered beading has a massive following throughout the world. Gagi’s website is http://www.ellad2.com. She and Rudy run a very successful business from their yacht selling her tutorials and patterns in five languages. She is highly regarded in the beading community and very creative. She’s also a mean volleyball player! I have been back in The Caribbean now for nine days and it’s great. Lovely to see Mal after my ten weeks back in Oz and fabulous to be back in this gorgeous part of the world (and warm weather). I had some problems getting back with delays, etc, but hey, that’s travel for you! Mal wasn’t too unhappy cos it meant I had time to purchase two volleyballs in Miami – you can’t buy them here. A friend in Oz asked how I’ve been spending my days. Relaxing is the answer. I have done two yoga classes, played volleyball twice, started book 1 of Game of Thrones, swum every day and experimented with some cooking recipes. We also went on a Turtle Watch tour (more below) and yesterday attended a dinghy concert (always fun). Me, down but not out! Yoga is free and hosted by fellow cruisers who find it easier to practice off the boat so they organise a venue. I’m loving getting back into it and attend classes as often as possible. Mal took up volleyball whilst I was in Oz and I definitely didn’t want to risk my knees, back, etc, but after watching one game I was sucked in and my competitive nature came to the fore! Anyone can play and we have children (very good at volleyball) from 10 up to oldies (Mal & me!). Mal is in grey striped top in 1st two photos and I’m wearing the visor in the 2nd two photos. We make sure we’re not on the same team or it could get nasty! Much beer is drunk between games and it’s a great social pasttime. This day we had four teams of six and everyone loved the new balls. The Turtle Watch tour was a must-do for us after hearing so many great stories from other cruisers. Before we went back to Oz the turtles were coming in to lay their eggs and we were told if we wanted to see hatchlings we should wait until July/August. Well, we were lucky enough to see both activities: three massive leatherback turtles on shore laying their eggs and babies hatching from two nests! The photos above are courtesy of Google as ours weren’t good enough to share but they give you a good idea of the size. The trip is a good 2-hour drive north to Levera Beach on the northeast coast of Grenada. We arrived in the dark and were given instructions by our guide about when we could use torches and how we should behave on the beach. White light torches were permitted through the walk to the beach but once we hit the sand we could only use red lights. Fortunately our friends Gagi and Rudy on Prairie Fox had lent us theirs. Due to the darkness, we had to walk in single-file behind the guide in case any babies were hatching and we inadvertently trod on one! She would alert us to any little tracks as evidence of newborns. The leatherback is the largest living turtle and travels north to places like Nova Scotia and south to Australia. It’s carapace is flexible where other turtles have rigid backs and it feeds on jelly fish in deep waters, up to 3000 ft. They mate at sea and she carries the sperm to fertilise the eggs. She will lay approximately 60-100 eggs at one sitting, but she will do this 4-5 times a season. Unfortunately, they estimate only 1 in 1000 hatchlings survive. The hatchling predators are crabs, birds, dogs before they get to the water and thereafter it’s other sealife or humans (fishing nets, etc). Humans also raid the nests to steal the eggs but slowly education is working and this is improving their chances of survival. We feel very privileged to have witnessed these amazing animals in the wild. Kool Kat (left) off Calvigny Is. Yesterday we moved from Prickly Bay to Clarke’s Court Bay. We have anchored next to Calvigny Island in beautiful clear water. We dinghied around to Mt Hartman Bay (the bay where we play volleyball) for the jumble sale. It is like a flea market and is an opportunity for cruisers and locals to sell or give away items they don’t need anymore. It’s also a great opportunity to catch up. Mal is with Pam and Chris from Wild Cat who Mal recently purchased an inflatable two-person kayak from. The other photos are from the dinghy concert in Clarke’s Court Bay in the afternoon. 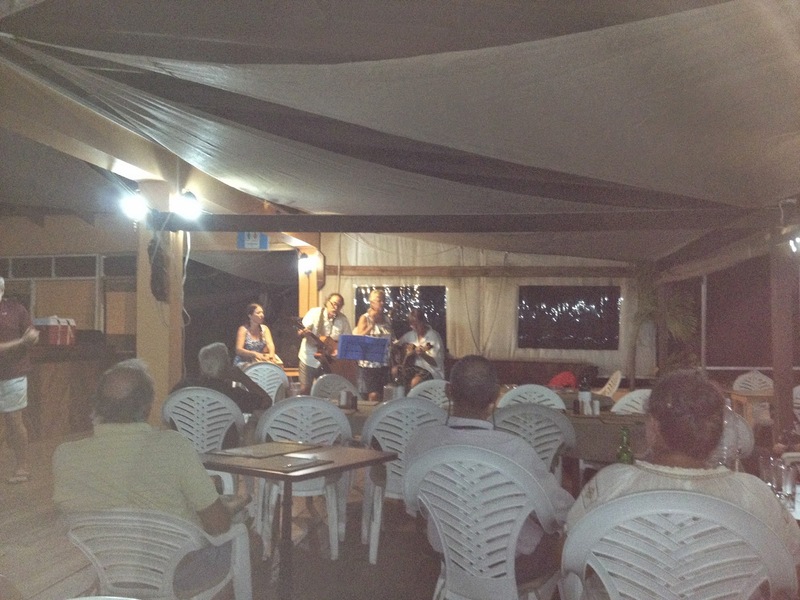 Great live music, beers, rum punches and lots of atmosphere. Even boat dogs attend – look for the Golden Retriever – she’s one of two on Nauti Dog catamaran. Clarke’s Court Bay is well served by pretty marinas. We called into Whisper Cove which is owned by French-Canadians for a drink and to listen to some live music. Whilst there I checked out their ‘mini-mart’ which has some fabulous meats and cheeses, as you’d expect. Because it was my first visit they sent me away with samples of their homemade pork terrine and a feta/pepper mix. Whilst there we noted the “iguana crossing” sign. We also visited Le Phare Bleu marina where we purchased fresh bread for our terrine and feta. Then down to Clarke’s Court Bay Marina where Jenny, an English woman who has lived here for 14 years, brings fresh produce for cruisers. 25EC later (about $12) and we had freshly picked rocket, basil and rosemary, mangoes, avocadoes, bananas, a plantain, a young coconut, a cabbage, limes and passionfruit. Back on the boat we took the top off the coconut, drank the juice and devoured the pulp. Unbelievably good! 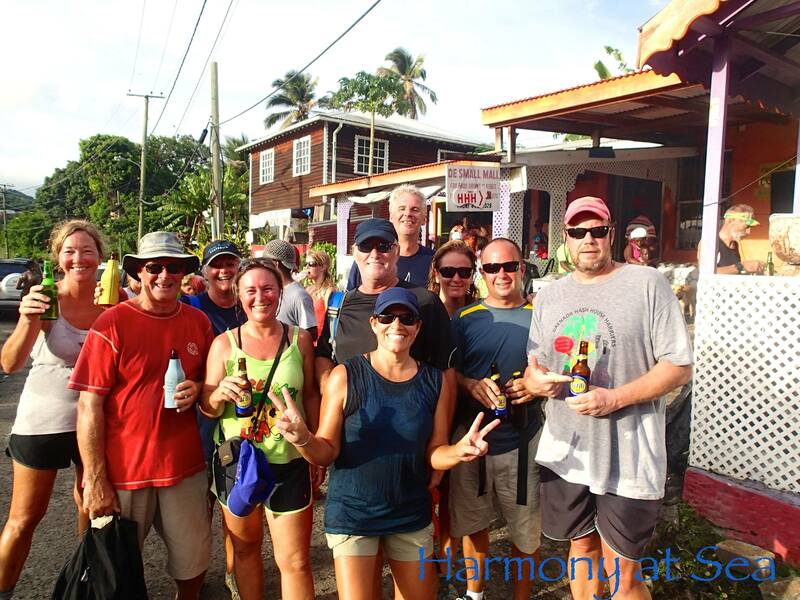 We had eight great Caribbean weeks of fun, meeting new friends, having Jo & Bob join us for 2 weeks before returning to Melbourne for Barb & Dirk’s wedding. We had just really got to know the boat and arriving in Grenada felt like coming home. We prepared the boat for my 2 weeks away as Sue remains in Oz for an extra 2 months to catch up with friends and be with Nick & Beth for Autumn’s 1st birthday in Sydney. The flight home from Grenada is fairly straight forward, fly to Miami wait a little while then on to LA rest up for a few hours then do the long haul back to Melbourne. But the best plans do not always go that way. We were almost 5 hours out of LA when some turbulence woke me and as I looked at the screen I noticed we had turned around and were heading back to LA. 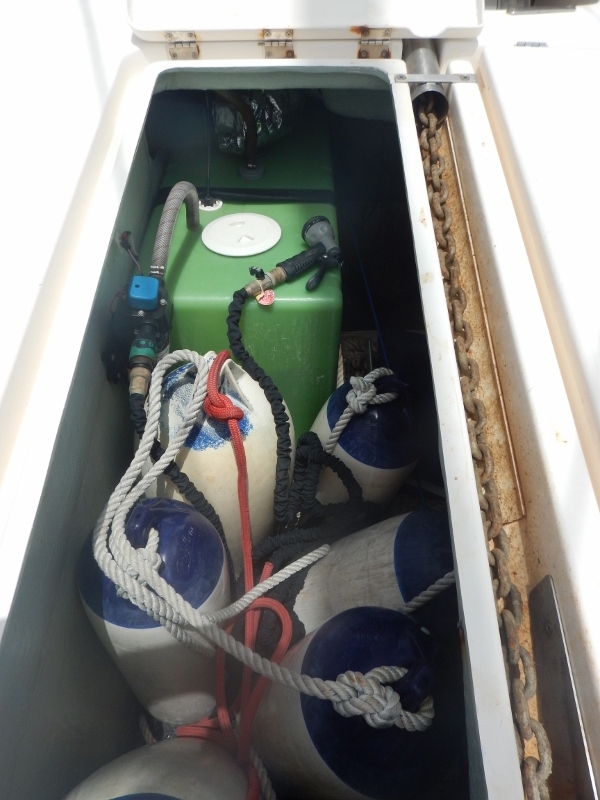 The short story is that the both fuel pumps on one of the tanks did not work and we would have not made it to Aus. So a 10 hour flight and a stay in an LA hotel courtesy of Qantas saw us fiy out the next day to arrive safely a day and a half later. The wedding went as planned; the bride and groom looked gorgeous and were very happy and a good time was had by all. Back on the boat life is good. 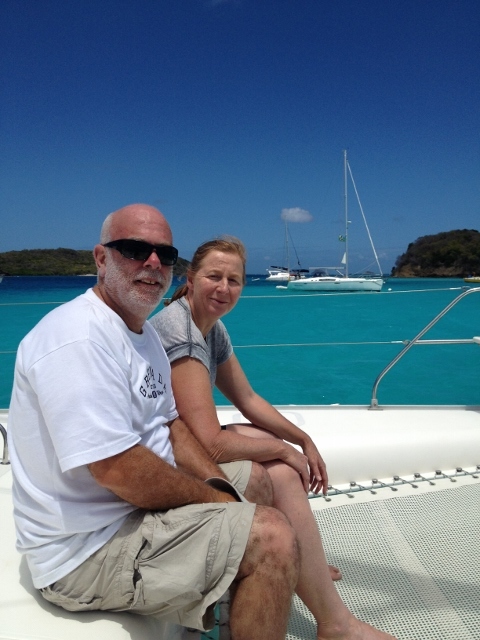 I was on a mooring in Mt Hartman Grenada which is such a beautiful spot. 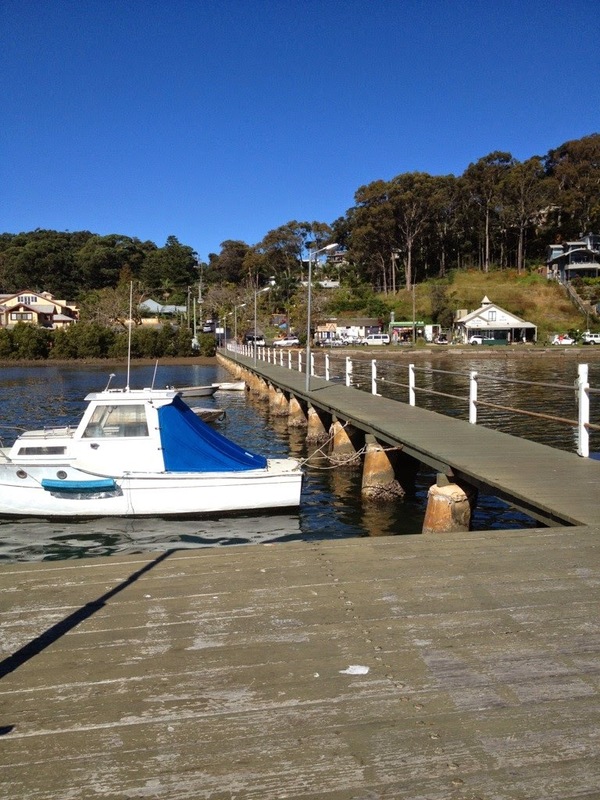 After a couple of weeks of organising the boat I moved to Prickly bay as access to the town and services is easier here. I have had my share of problems, the generator was overheating (cleaned out the heat exchanger), the water maker boost pump failed ( new ) purchased another and all is good, the batteries were not holding voltage found one was dead and so replaced them with 8 golf cart 6 volt batteries. 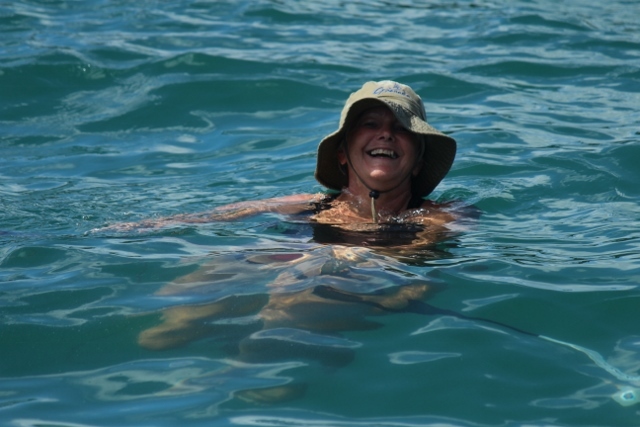 I miss Sue as first mate and my days see me changing/fixing/polishing something on the boat, playing volley ball with other cruisers 3 days a week, happy hour at the bar ( a beer $1.75 Aus) lots of walks, catch the cruisers shopping bus to the IGA and lots of reading and swimming. Have met a lot of interesting and friendly people who have sailed from all over the world and have such interesting stories to tell. I am in awe of their adventures and achievements when we are doing it the easy way. When Sue arrives on the 27/6 the first thing we will do is the Turtle watch at the north of the island which at present is really special as some of the female leather back turtles weighing up to 500 lbs are laying their eggs and some of the previous layings are now hatching and cruisers are saying how wonderful it is to see both events especially the little ones trying to make to the water. Grenada is the 3rd largest site to see these turtles. 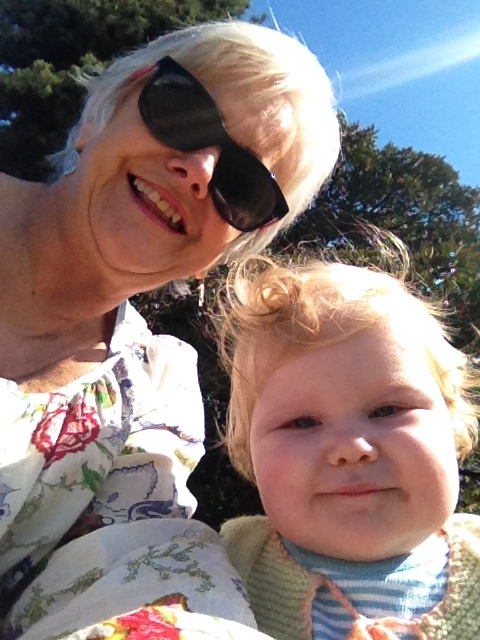 Coming to the end of my time here in Oz and I am having very mixed feelings. Whilst I am really keen to see Mal and return to our Caribbean adventure I have had a ball in Melbourne and Sydney and it will be hard to leave. Melbourne was a very busy time with Dirk & Barb’s wedding and catching up with family and lots of old friends. The wedding was a great success and they were so happy! 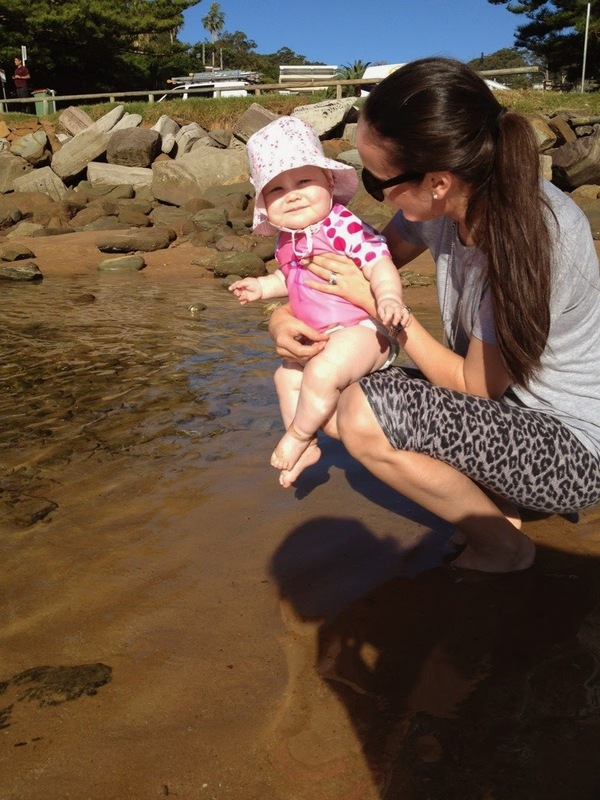 Sydney has been more relaxing with quite a bit of time spent further north with son-in-law Nick’s lovely family at Copacabana, a gorgeous little seaside resort. The weather has been mixed and is getting quite cool now for Sydney but I’ve had a ball. How could I not? 5 weeks with Beth, Nick & Autie; I know I’m biased but she is a delightful child and they make a great family unit. Someone asked me how we fill in our time so I thought I’d give a snapshot of a week on Kool Kat whilst we’re in port. Whichever port we are in we tune in to the Cruisers’ Network on the VHF. 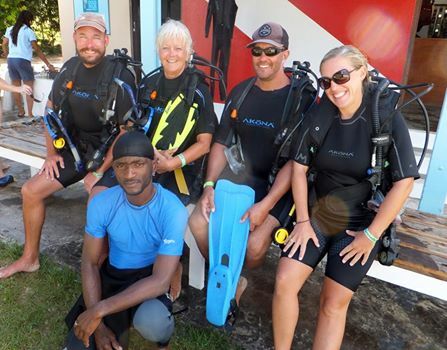 In Grenada it is at 7.30am Monday-Saturday and keeps cruisers up to date with security issues, boat arrivals and departures, social activities, local business offerings and provides a buy, swap and sell segment. So, this is daily must-do for us. 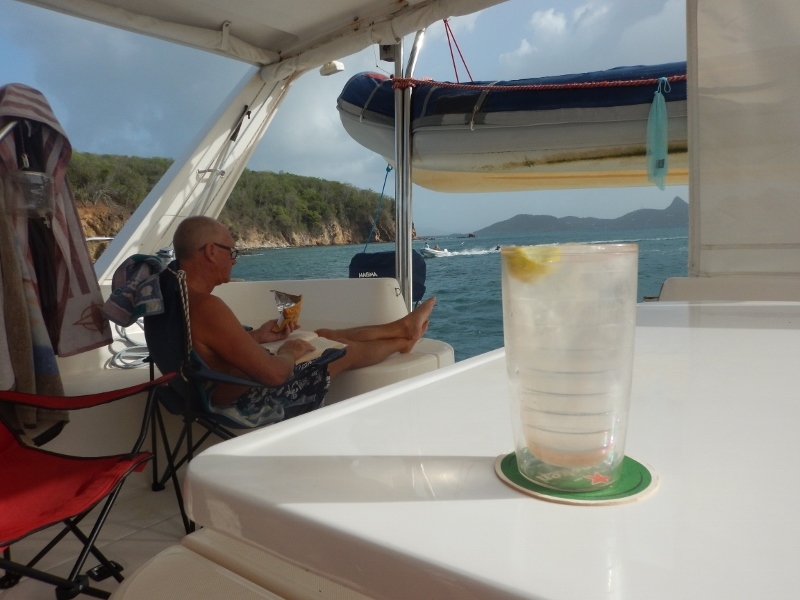 Monday 31 March: glorious sail from Carriacou to Prickly Bay (see previous post 31/3/2014). Went to Prickly Bay Marina for happy hour and 1/2 price pizza night! Tuesday 1 April: After breakfast, we went shopping. This involves taking Kitty (dinghy) into a dock and catching a bus into Grande Anse Spice Mall which has a very good IGA. During the morning we walk by many stalls on the roadside, one of which sells fresh coconut juice. He cuts open the coconuts and fills either a 500ml or 2litre bottle with the juice. I bought the large one for 15EC ($6.50AU). We also stopped at a mobile food van which had been recommended to us; a woman from Trinidad who makes the best “doubles” outside of Trinidad. These are two small pancakes that are placed overlapping each other with a curried chick pea concoction on top. She then adds four different sauces, one of which is quite hot. It is then rolled and wrapped ready for you to eat. They are to die for in my book and cost 5EC (roughly $2AU). She and her husband have tap water and paper towels for you to use after you’ve finished as they are designed to be eaten with your hands! Back on the boat in the afternoon for a little reading and swimming. Ricky of De Big Fish tells us he’s closing in a month’s time so we decide to have dinner there as we will be gone when he closes his doors and we’ll miss it – it’s become quite an institution for cruisers. 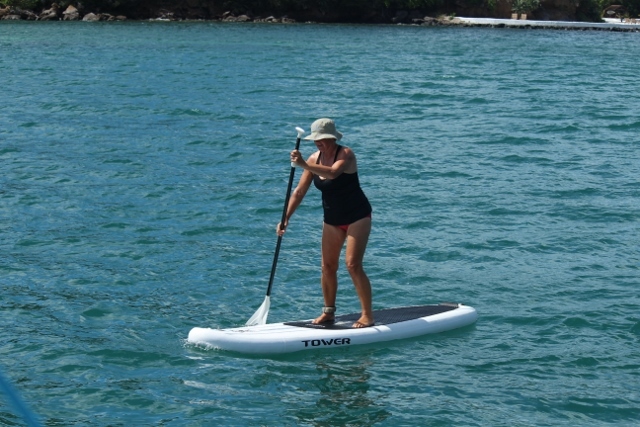 Wednesday 2 April: Lazy morning reading and swimming but Pete and Dee from Wind Lass, who we met in Carriacou, have arrived in Prickly Bay and drop by for coffee. 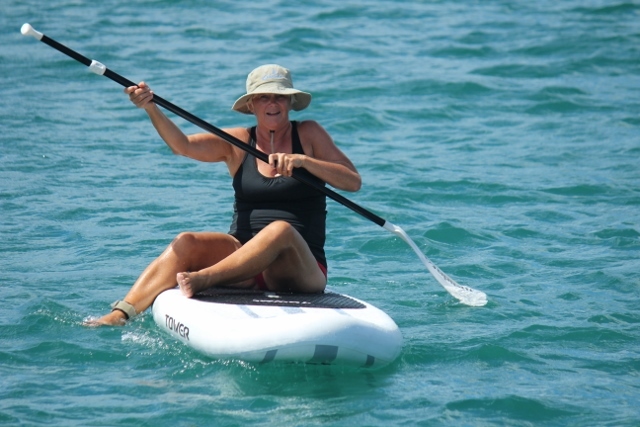 After lunch I use my new dinghy-driving skills and pick up Dee and we both join 12 other women for Mexican Train Dominoes. I’m the newbie as I haven’t played dominoes since I was a child and everyone else is very experienced; I think it’s a cruisers’ pasttime. I had a great afternoon; loved the game and it was so nice to have “girl-time”. It’s a weekly event so I’ll become a regular I’m sure 🙂 We have grilled mahi mahi from our freezer (see previous post in Tobago Cays 14/3/2014) on the boat for dinner and we watch another two episodes in the series, Downton Abbey. Yes, we’re loving it Jennifer & Wayne. Thursday 3 April: After breakfast we drop off two bags of washing which will be ready the next day. 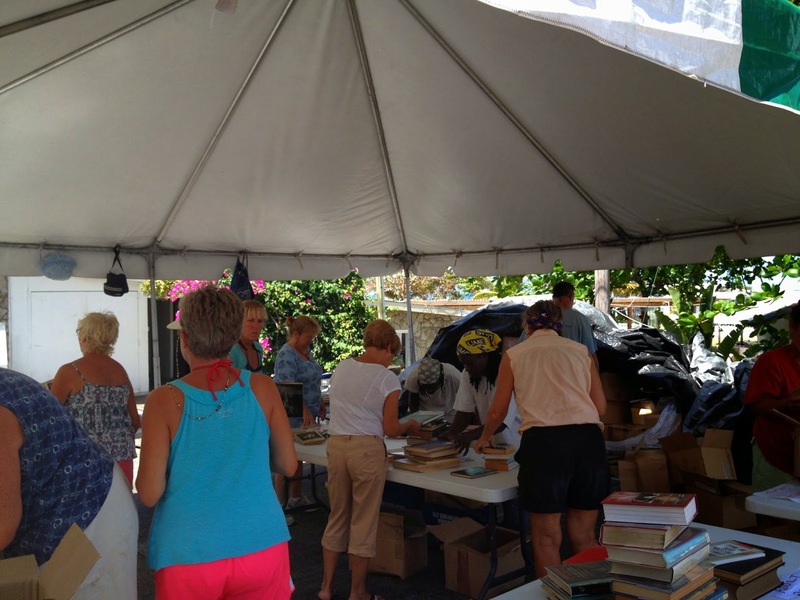 I volunteer with other cruisers to “sort books”. Two years ago Scotland donated a large amount of books to Grenada and they’ve been sitting in Customs ever since. They have now been categorised and can be distributed to schools, libraries and community groups. Back on the boat and Junior Kofi arrives in his boat selling fruit and veg. We have bought from him before and his produce is fabulous; very fresh and sweet! We buy tomatoes, pineapple, avocadoes and passionfruit. After lunch we meet up with Dee and Pete and some other cruisers to walk around to True Blue Resort for a cooking class. What a hoot! 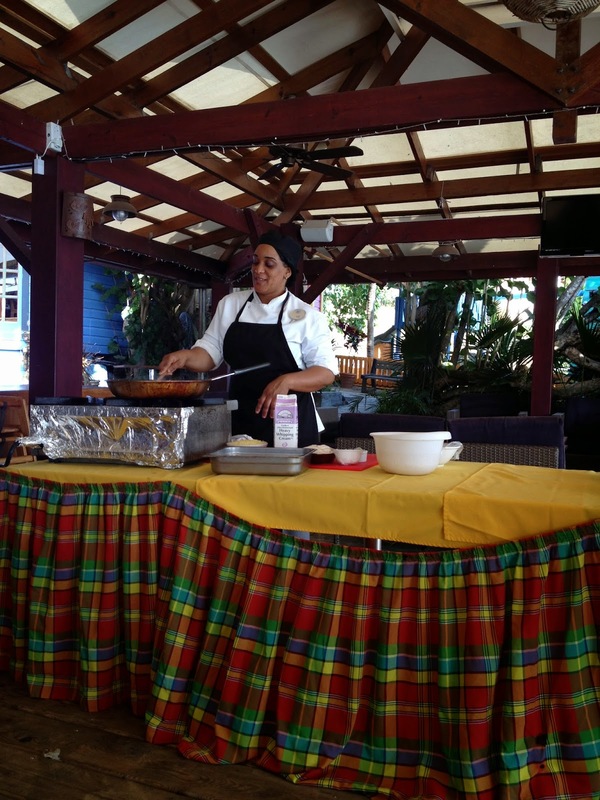 We watched how to clean and cook curry lambi (conch), scalloped potatoes and rice and peas (pigeon peas). There were approx 30 people and we each got a plate of food to try – all for 12EC ($5AU). Unbelievable value! Friday 4 April: Mal’s birthday! After cooking a delicious breakfast for my beloved we go ashore to pick up our neatly folded and clean washing. Back to the boat where we do some maintenance jobs: Mal polishes areas of gelcoat and I’m cleaning the stainless steel. Mal’s always doing something on the boat even on his birthday! We have a swim, do a little reading and then get ready for dinner. We have been invited to a BBQ buffet with Doc Adams playing at The University Club (St George’s University) which is on the shores of Prickly Bay. We had a table of 20 and Mal shared his birthday celebrations with Steve from Starshine. The food was fantastic and we danced and sang to some great music. We missed you Linda Moorhead (another 4/4 birthday)! Saturday 5 April: Whilst I attended the Mt Airey Reader’s Program (see previous post 2/3/2014) in the morning with 10 other cruiser volunteers, Mal “equalised” the batteries. As we had a number of volunteers on this trip, I was fortunate to only have three children assigned to me. Previously I had eight, which was much more difficult. Quiet afternoon on the boat: swimming, reading, checking emails, etc followed by a quiet dinner and another two episodes of Downton Abbey. Sunday 6 April: Our 18th wedding anniversary! 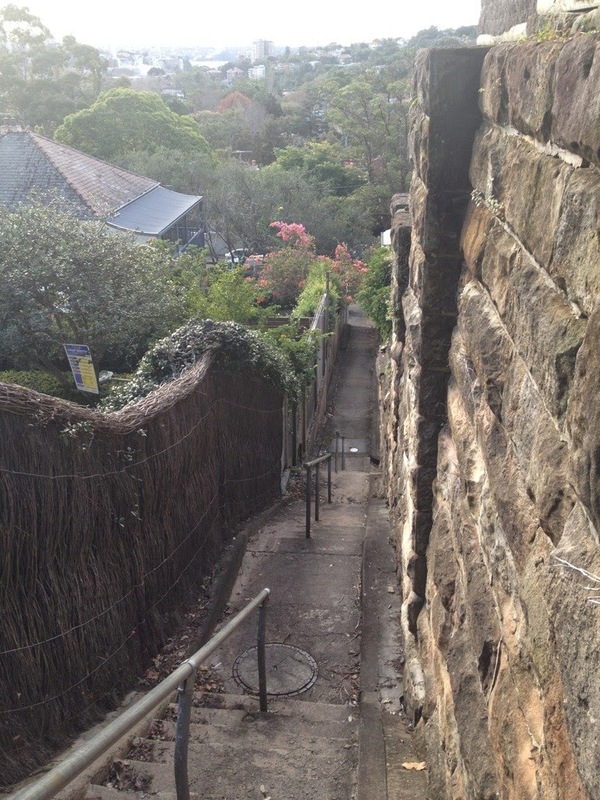 We decide to take a walk around to Secret Harbour and then another walk in the opposite direction to visit a new cafe and for a stroll through the University’s grounds. Very interesting – they have studies in medicine and vet medicine and many US students come here for the first few years of their studies as it’s cheaper. They have students from all over the world and the campus has a real buzz to it. They also offer arts programs. We decide to walk around to True Blue Resort to have dinner at Dodgy Dock – another very nice meal at this resort. I should add that everytime I mention walking somewhere, it is only after we have dinghied into shore so we are very reliant on our little kitty. Monday 7 April: We joined 11 other cruisers for an Island Tour with Cutty. What a fabulous day. Mal and I did a tour years ago with Bruce and Gina but I was very jet-lagged and must have missed alot of it! Cutty is a local who knows everything there is to know about this beautiful island. I think I’ll leave that for another post as there is alot to cover and this post is already getting very long. Tuesday 8 April: We visit Grande Anse Spice Mall again for our weekly shop. We’re nice and early so it’s over and done with quickly and we drop into Budget Marine to check on our order for a pump for our water-maker. Alas, it was due to arrive today but someone has mucked up our order and it will take another week. Not happy Jan. We think we can manage with what’s left in our tanks if we’re prudent and there’s not much else we can really do! The afternoon turns miserable – rain squalls come through consistently all afternoon but it’s still warm and we take a swim between showers. We are due to attend an “Open Mic” night at De Big Fish which starts at 6pm but it’s pouring and we don’t know how we’ll get in there. Finally there is a break in the weather and we make a dash for it. Open Mic nights are when cruisers get together to play music and sing. 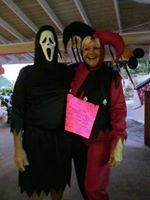 This one was organised by Jan and Larry on Sea Bear to encourage cruisers to visit De Big Fish before it closes. We had a fantastic night with an amazing array of talent on display. Well, that’s roughly how our weeks drift by. 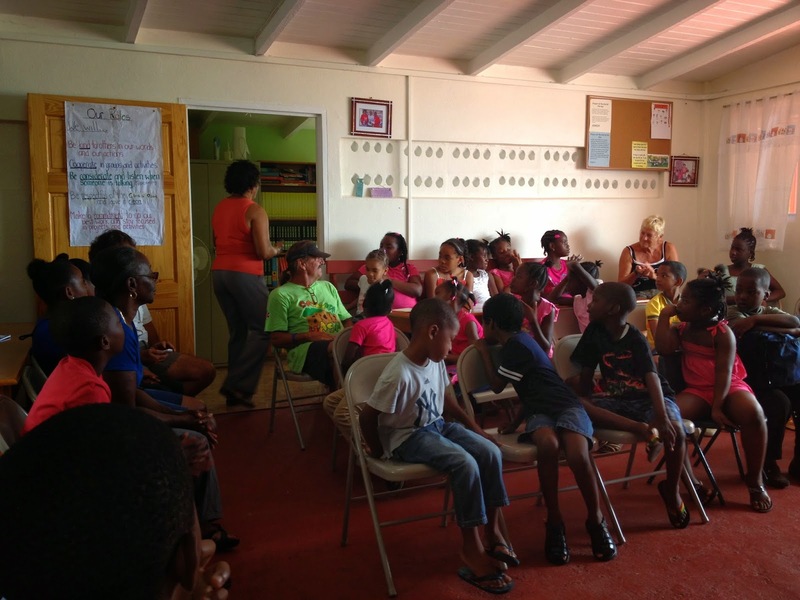 A little boat work, shopping, swimming, lots of socialising and meeting new people, volunteer jobs, reading, exchanging recipes and stories and learning more and more about KK. PS: We’re now only 14 hrs behind AEST with daylight saving having finished!